Julius Caesar, the great general, leader, politician and philanthropist, was assassinated by a greedy senate on the Ides of March, 44BC. History books tell us that this ordeal would set in motion the end of the Roman Republic but what if the history books were wrong? What if after being tragically murdered by the senate, Caesar were resurrected by Cleopatra’s Egyptian magic to reap unrelenting vengeance against those who conspired against him? 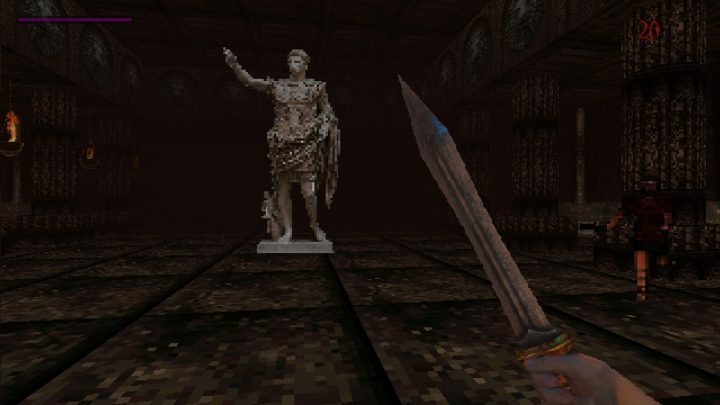 Caesar’s Revenge is a retro fps inspired by games like Heretic, Wolfenstein 3D and Exhumed. The design is focused on being fasted-paced with an emphasis on constant movement and chaining kills. 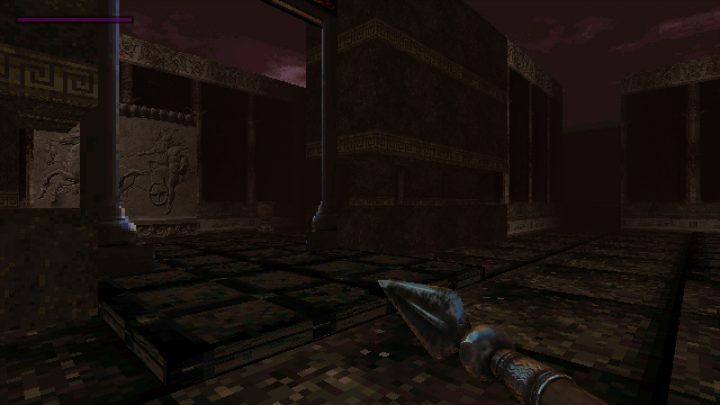 Slash, stab and shoot your way through iconic locales of the ancient world to cut down those who betrayed you. Bring the true fall of Rome. We have made quite a bit of progress on the game so far though we didn’t start a devlog sooner to ensure it would be a project we wanted to continue with before showing it off. Nevertheless, we have documented most of our progress this far and will be making a number of retrospective posts to show some insight to our early thoughts and experiments. We are currently a team of three working on the game in our spare time after work and are very excited to start showing off what we have made so far. We will also be updating our new website www.pixelbarons.com as things progress. Some may consider making what is essentially a FPS on a 2D plane as too much of a cutback but I find myself inspired by the simplicity of early games in this genre and the amount of content that can quickly be created for this kind of game. Early shooters of this style evolved quickly as technology advanced and I feel as though there is still a lot of design space that hasn’t yet been explored yet - Gun Godz being one of the few modern examples that interprets the space really well. In some ways it is more like designing a top down shooter except the player’s perspective is altered. It is interesting how even at this stage wall heights can give the perception of large spaces even though the gameplay is 2D. This image shows a billboarding sprite test with 16 directions. This was one of the first challenges we faced - mapping a sprite sheet to a camera facing plane that would update the index based on the angle difference between the player and the enemy’s facing direction. While this example doesn’t show it, accounting for animation and different states also brings an extra layer of complexity to the system. All of the weapons (both player and enemy) use projectiles as opposed to a hitscan approach in the game to emphasise moving and dodging. Firing projectiles was causing some issues as the default collisions weren’t precise enough and the projectile would sometimes skip over objects if it were moving too fast. A script named collision_line_first (from gmlscripts.com) was extremely useful and is an easy way to check what object is hit first by checking a collision line between the projectile’s current position and its predicted position for the next step. The coordinates of the bullet can then be updated to allow it to stop right on the edge of an object which will be important for hit detection and effects. 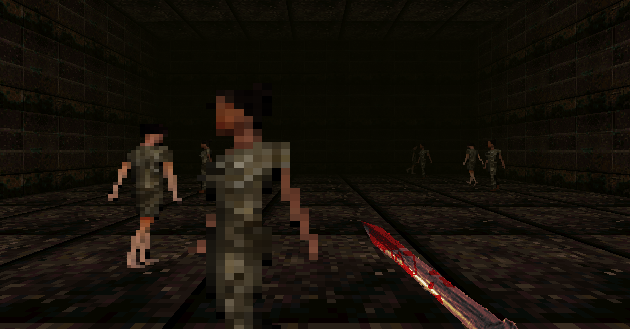 Here is an early combat test with a number of soldiers attacking the player. We want the game to be fast paced and have a focus around small as well as large scale encounters. The AI shown below is for a basic melee enemy that won’t be too much of a challenge on its own but will be deadly in large groups. I will post more about enemy types later but the basic idea is that there won’t be too many varieties in the game but they will stay relevant throughout. This means there won’t be too much power creep in the weapons and even the weak enemies can be dangerous. Different group compositions will provide variety with clear strategies needed to defeat the more advanced opponents. They currently don't collide with one another - partly because I haven't coded it but I actually like how it allows them to move in really chaotic swarms. This image also shows how the process of creating 3d models and pre-rendering them as sprite sheets is going to look in the game. Textures are place holder but are all taken from photos we have taken. The basic enemies will be soldiers, archers and phalanxes as well as a some late game opponents that we are still designing. The enemy sprites are rendered at 8-16 different directions for each state with up to 16 frames of animation. These ones are all 64x64 which gives it the retro look we are after yet enough detail to make them readable - this size seems to situate them better in the world than some of the higher res tests. In Caesar’s Revenge we have decided to forgo traditional health pick ups in favor of a bloodlust mechanic - killing will fill the bloodlust meter and once triggered, the player will increase speed and gain health from both hits and kills. The idea of this is to incentivise an aggressive playstyle where instead of hiding at low health, the player is forced to push forward. This also encourages a fast pace of play as the bloodlust meter depletes if the player hasn’t landed a hit recently (meaning playing passively is a huge disadvantage). One consequence of this is that newer players may not be accustomed to playing aggressively and will find it hard to survive if they are unable to chain kills. Our way around this is by including civilians in the game. 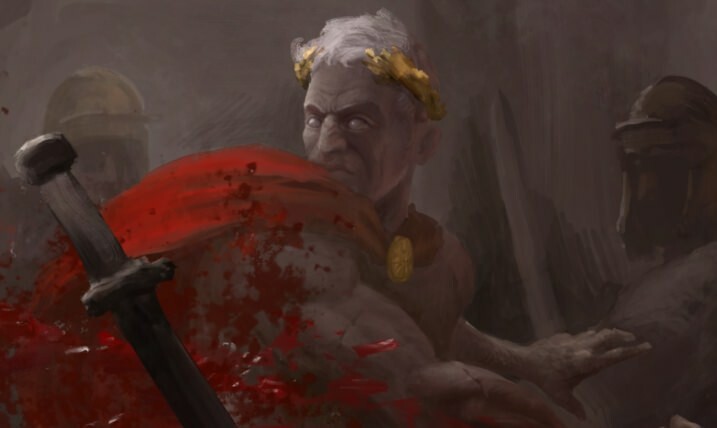 As a ruler of the people, Caesar has no ill will against the innocent and so the player will be faced with the moral question of whether or not to kill civilians to help chain kills, or take the harder path of only entering combat with soldiers. These units will also help to bring the environments to life and make levels feel more situated in real places. We decided to make two varieties of the civilians so their placement would be a little less repetitive. 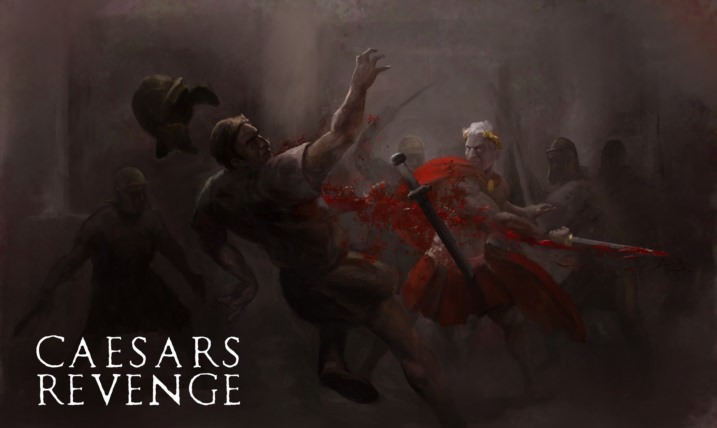 They will also have some unique reactions to the player as well - some will flee or cower while others will cheer the player on - even after death Caesar had many loyal supporters! This art is awesome and I love the sound of that gameplay. I'm really looking forward to seeing more! The Gladius is the iconic sword of ancient Rome. It is distinguishable by its length and shape, short and stout in comparison to more modern swords. 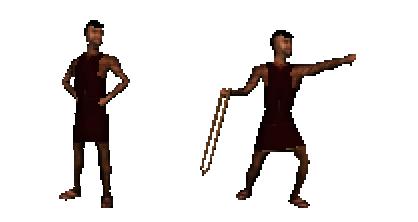 It’s an excellent chopping and thrusting weapon, common in any Roman military force. These attributes combined make the Gladius an excellent candidate for the primary weapon of Caesar, you will be seeing a lot of this guy. The swordplay is evolving as we develop and add new features and mechanics. In its current state it reflects the qualities of the historical equivalent. Caesar’s Gladius has 2 alternative attacks. The first being a quick horizontal slash, it’s fast and it’s perfect for gutting multiple enemies if you can line them up. The second, a slower windup followed through with a powerful stab that is sure to cause devastating damage, that’s if you are pro enough to land it. 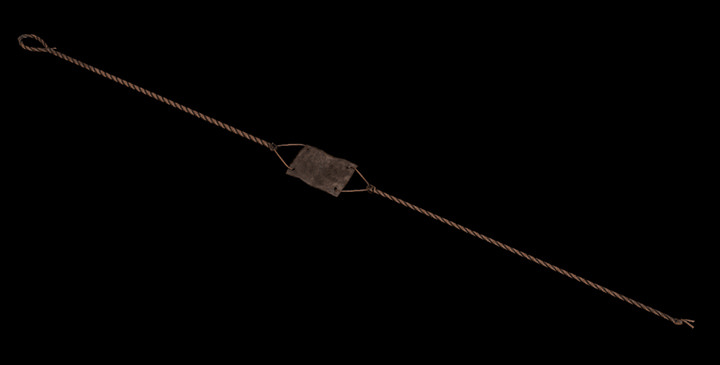 The Roman composite bow was the principal weapon used buy the Roman Auxiliary: Sagittarius. 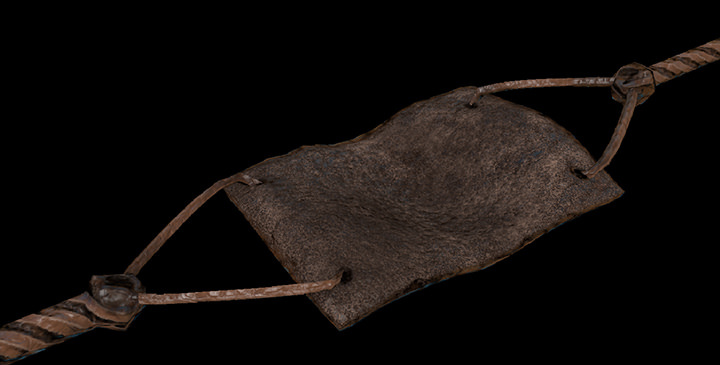 It was used commonly in both infantry and cavalry units. A popular weapon in the outer edges of the empire, especially in the east. Caesar was a big fan of archers and used them as a defensive tool, laying down fire to protect flanks and thin out charging enemy attacks. The pikemen attack seems to have a bit too many frames, considering the lowpoly/retro feel. Thanks for the feedback! I think it is the close range combat that makes me okay with having more frames compared to older shooters as well as the more realistic looking characters. We have actually gone a bit overboard with the pre-rendering, hopefully the style looks distinctive and stands out among other games in the genre. For example, the attack animation is 16 frames with 16 directions making a total of 256 frames when accounting for all angles. Most enemies have a number of states (walking, running, attacking, death animation etc) so this number adds pretty quickly with the average enemy using about 1000 frames. We actually faced an issue with GameMaker itself in that the compiler crashes when exceeding about 9200 textures. Tests made me think that we were going to be limited to about 8 different enemy types but we recently discovered a way around this by doing animations as a strip and loading the images after the game starts (we may actually need a loading screen depending how we go about it). It is interesting because the game itself doesn’t crash or lag from the high number of frames but the GameMaker compiler itself crashes when saving when trying to compress everything into textures. Obviously we can optimise this frame count a lot more but it will probably be a later thing as all of the other systems and aesthetic decisions come together. 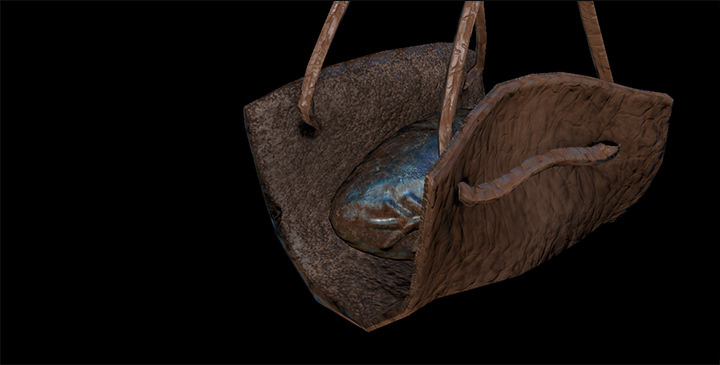 Sneak peak at the new weapons in development the sling, with a lead shot. Thanks! We are using GameMaker which is really designed for 2D games - I know you can import models and there are dlls to expand functionality but we aren't really going any deeper than drawing flat planes and basic shapes at the moment. It is funny, because we have talked about what the game could be like if we had have done it in Unity but then we'd be struggling with different issues like ai and gameplay that we can easily do in GM. On another note, I have been experimenting with adding traps to the game. This perhaps breaks theme a little but at a stretch they could be found in ancient booby trapped tombs or even some of the more sadistic gladiator arenas. It will be good to have some elements to give levels more variety beyond combat. Inspiration comes largely from Tomb Raider 2 which had a number of devious, low poly dangers of a similar vein. Textures aren't final. Spikes come in and out of walls. They can be activated by triggers as well as scripted to have different speeds and offsets to make simple movement puzzles. Spinning blades can be pathed to travel around the room. Theses ones are quite basic but could later do things like circles or take only left turns etc. The look of this is quite interesting! I'm a huge Roman history buff, so I'm thrilled to see games set in this time period and using this aesthetic. 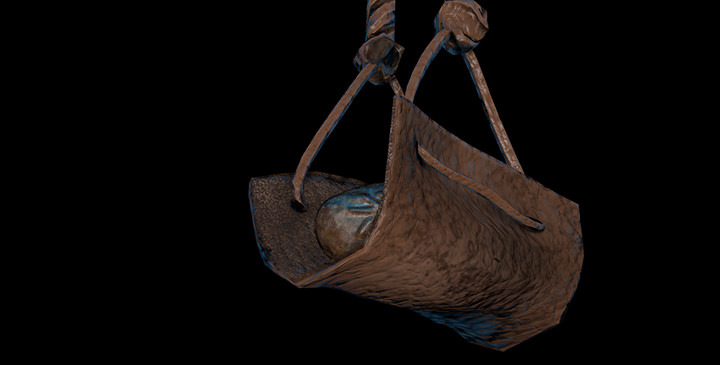 Minor details like the design of the lead sling balls are really impressive - so many others would just overlook stuff like that. I also think you're making the right call with the bloodlust mechanic. Too many games have a problem where the most fun way to play is NOT the most strategically sound way to play, which always feels...disappointing. I think this is a good fix, that should prevent players from grabbing the bow and just strafing backwards all day long. Yes! More old school fps! For some reason I just don't like the modern fps, old school fps seems to distill everything I like best about the genre and I love the historical context, not something you see everyday. The spear in Caesar is a hybrid between a more traditional Roman javelin (pilum) and a leaf-bladed spear. 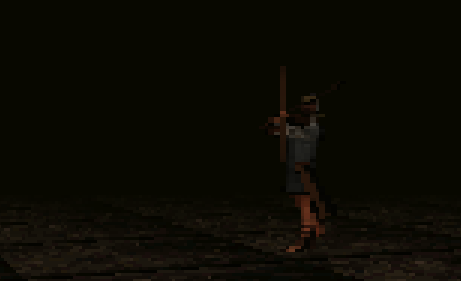 This choice was made to aid in the readability of the spear in gameplay. The pilum-shank in historical pieces is very thin and this makes the end of the pilum hard to see. A large flat leaf-blade spear shape made more sense and enables you to easily see where you are stabbing. Pila were used most commonly by infantry and were thrown at an advancing infantry/cavalry force to thin them out before advancing with gladius. Soldiers would often have multiple pila for multiple volleys before engagement. Pila could also be used in melee, but his is rarer due to the frail nature of their shank. Thus the thicker leaf-bladed spear hybrid is a superior weapon for the one man army Caesar. 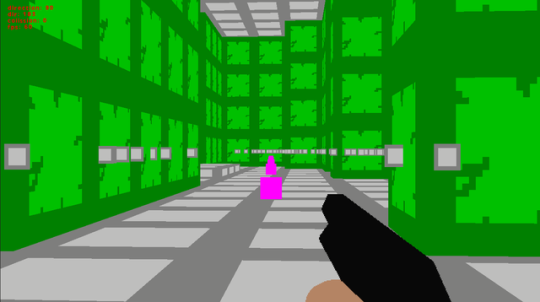 I have an aching desire to see how you made the 2d plane FPS core. Hi OccamsRazor glad to hear that you are interested in the game's development. Yea it's hard to get people not to run away from the action to the safety-net of the corner to shoot from. We plan on having units move at different speeds and want to make the bow feel like an M1 grand rifle, not something you would just spray ammo out of. Hi joey4track couldn't agree with you more. jb, MattMakesSwords and I have talked at length how there is a strange effect that watching Ben-Hur lends the movie credence due to it being a classic film with an ancient times theme. This is what we want to achieve with Caesar's Revenge. A respectful homage to the brutality of Rome and early days FPS. Hi eyelinder we are happy to hear that you are intrigued. The core of the code is 16 frames of animation in 16 directions. The character can face in 360 degrees which means divide the 360 into 16. This is 22.5, using this number you can get the animation to change facing direction row. It was much trial and error. At some point, we may do some more technical posts at this stage we are preoccupied with getting content in and getting art for the game and promotion. On that point here are some promotional works we had done for the project. 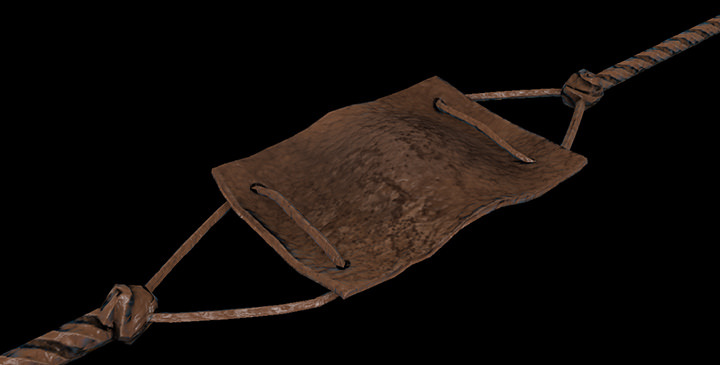 To match up with the sling that Ivan made, we have been working on a new enemy today: the slinger. A focus of our enemy design is that different units will stay relevant throughout, even into the late game. We don’t want to do recolours or higher health versions of the same types of enemies, instead difficulty will increase by the number of opponents as well as the unit composition of each encounter. With this in mind, even early game enemies can be deadly later on. One issue we were facing however was that early game units such as the archer become quite easy with the stronger weapons but we didn’t want to strengthen archers as they would be too powerful for new players. To solve this issue we have added a lower tier slinger to allow for early game ranged combat while enabling the archers to be stronger without throwing off the balance. 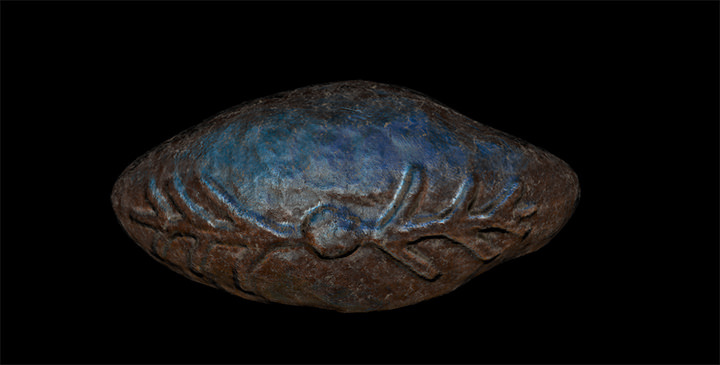 We chose this enemy because it is less armored (lower hp) and in the game, will be shorter range and less precise than the Roman archer. The enemy was inspired by the historical use of auxiliary troops in the Roman military. These auxiliaries weren’t Roman citizens and would be paid considerably less than the Roman soldiers. While a slinger’s inaccuracy, low health and insubstantial damage output make them fodder for Caesar’s bloodlust - larger cohorts have the potential to be more of a threat. Their AI spreads them out more than other units and their inaccuracy makes for widespread volleys of stones in greater numbers. Ancient Rome fact: Roman soldiers were honorably discharged after 25 years of service and would receive either monetary payment for their time or be gifted land of their own. Auxiliaries however, were not citizens and in addition to being paid half as much as their Roman counterparts, after 25 years of service they would only receive a diploma of citizenship (this is the origin of the term) - no land for the poor slingers, only the honor of becoming a Roman! I like the promotional art. Great style. Keep it.